The SPS IPC Drives is Europe’s leading fair for smart and digital automation. It is conducted usually in November at the Nuremberg fair area (Nürnberg Messe). This year, the event had over 70000 visitors, 1675 exhibiting companies covering a total exhibition area of 130,000 square meters. Of course, SAP couldn’t miss out such an important event and had a strong presence to exhibit latest innovations around industry 4.0 and smart factories. One key theme of SAP’s presence was our collaboration with our partner eco-system to tackle both, the software and hardware aspect of industry 4.0 and IoT solutions. Among many other partners SAP exhibited joint showcases with Pepperl+Fuchs, a German manufacturer of industrial sensors with headquarter in the City of Mannheim – not far from Walldorf. Founded in 1945 Pepperl+Fuchs is today an employer of 5600 highly skilled professionals in many locations around the globe. One showcase exhibited an IoT-driven solution for replenishment of a distributed network of silos and tanks. Such silos and tanks are common in construction, chemicals, agriculture, and food industry. They contain products and raw materials such as cement, minerals, liquids, grains, sugar, fruit compounds, flavors and many others. Customers need these products to be always available in best shape and quality to ensure the quality of the products they make out of it. These customers also desire to be released from the burden of timely reordering replenishment of the silos and tanks in their facilities – they’d rather spend their time on what they are best at. That’s a great opportunity for the vendors of the products in these silos and tanks to strengthen the relation to their customers by providing a digital experience that automates replenishment and audits product quality at all time. And this is where SAP and Pepperl+Fuchs with their integrated solution for IoT driven replenishment of silos and tanks step in. 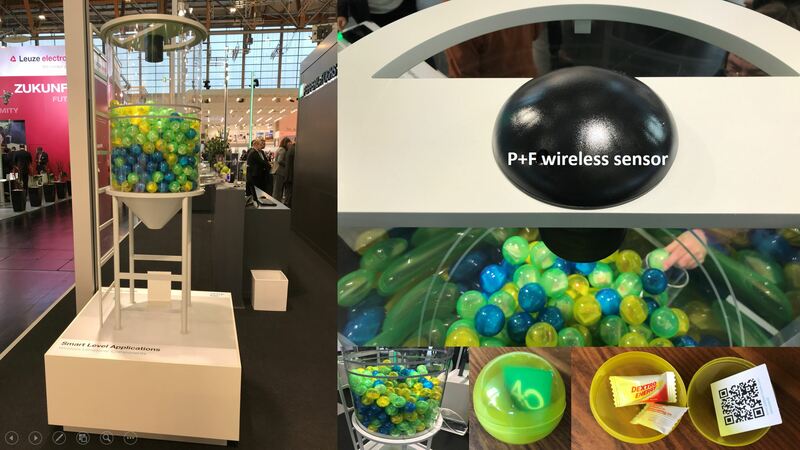 In the showcase shown on the photo Pepperl+Fuchs mounted one of their ultrasonic fill level sensors onto a demonstrator silo filled with colored balls containing some give-aways. Pepperl+Fuchs offers sensors that are wireless and battery powered with battery life time of up to ten years – depending on the frequency it sends data to the cloud. The sensors can connect to the cloud either via GSM or newer technologies such as LoRa network infrastructures. Once the sensor data including fill level, battery level, and ambient parameters (temperature etc.) 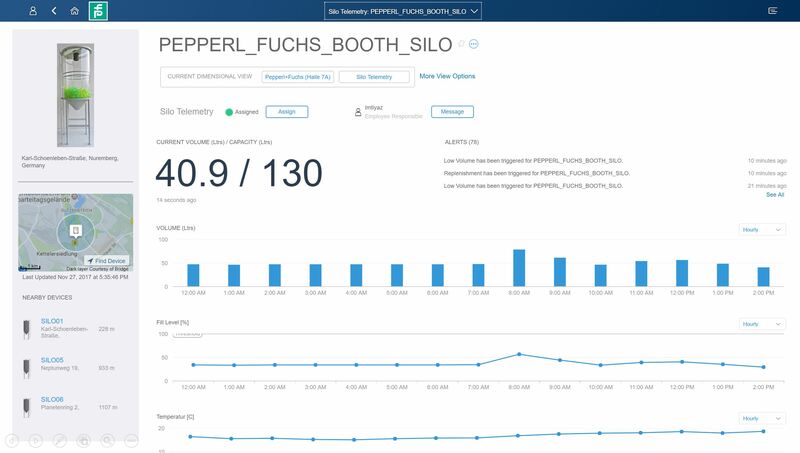 is ingested into SAP Cloud Platform SAP’s standard application SAP Connected Goods takes over (screenshot at the bottom) and runs the business for the silos and tanks. It not only visualizes the fleet of silos in tiles, tables, maps, trend, and aggregation views, but it also triggers the right action at the right time based on a flexible rules engine. It knows when to replenish and triggers seamlessly the purchase order in ERP. It knows when to replace the battery in the sensor and creates transparently a service ticket to send out a technician – for example in SAP Cloud for Customer Service or any other ticketing solution. It would also warn about the risk of product spoilage due to head, cold, or humidity. Bottom line, this showcase demonstrated insight to action at its best – SAP and Pepperl+Fuchs working as one team. screenshot: SAP Connected Goods: Detail view of demonstrator silo displaying fill level, fill volume, time series, alerts, and silo location.